Just 10 minutes walk from Killarney town centre, the Killarney Court Hotel features comfortable three-star rooms and its own traditional Irish pub. 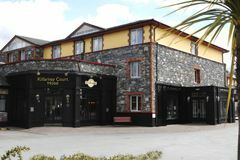 Located in the popular tourist town of Killarney, the Killarney Court Hotel offers cosy rooms with elegant furnishings, including satellite TV, free Wi-Fi and free parking. McGillycuddys is a traditional Irish pub set in the hotel and offers a daily Carvery and bar menu. The Seasons restaurant has table d'hte menu and a wide selection of International wines. For any non golfers in your touring party, the Beauty & Spa Treatment Centre offers a range of treatments including facials, body wraps and body scrubs. A wide range of massages and sun beds are also available.